(October 30, 2013) In April 2012, Liu Bai, a retired journalist dedicated to exposing the plight of Three Gorges Dam migrants and the project’s resettlement legacy of shattered lives, set out to discover what had happened to the first group of migrants who were moved from their homes in the ancient town of Dachang, in Wushan County, Chongqing Municipality, and resettled elsewhere around 11 years ago to make way for the world’s largest dam. What Liu Bai did not expect to find at the other end was that the resettlement of these migrants had not stuck! The majority of this first group of migrants had in fact returned home. Danchang, Wushan County, located in Southwest China’s Chongqing Municipality, survives as the only well-preserved historical site in the Three Gorges Dam reservoir region. “Totally relocated and rebuilt with original appearance,” much of its ancient architecture was dismantled and reconstructed elsewhere to avoid submersion by the Three Gorges Dam, which counts as a rare save when so many other sites of cultural value in the region were destroyed. Unlike the town itself, Dachang’s residents did not fare as well. Some 17,600 people — half the population of Dachang — were relocated outside of the reservoir region as a result of the dam but their circumstances were not, like Dachang, reassembled as an approximation of what they once were. Liu Bai set off to find out. What he discovered threw him completely: the majority of this first group of migrants to be resettled had returned to their original places of residence! Their reasons for risking a return very much reflects another oral history published by Probe International last year, also by Liu Bai: Dammed and Betrayed, in which Wang Like, a Three Gorges Dam migrant, passed on his story to Liu in the hopes the ex-journalist would be able to locate a forum for his experience of betrayal and abuse as a result of his sacrifice for China’s massive Three Gorges Dam vanity project, only to be made to feel like an enemy of the state when both country and neighbour turned on him. Here again, Liu acts as messenger for more migrants whose lives have been upended by the dam project: stories seldom heard, united in their common theme of dam-related suffering. 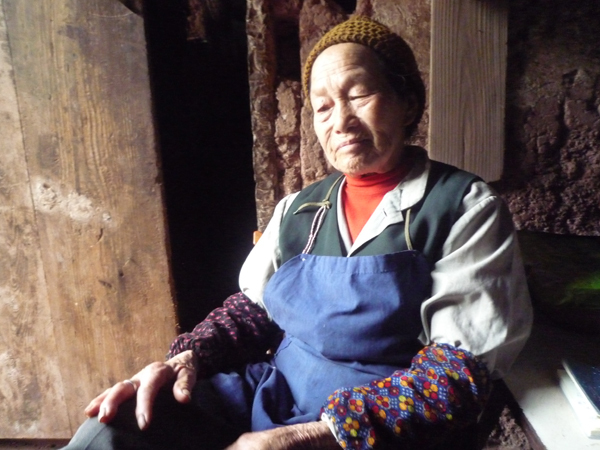 Zhu Guixiu (74), one of the migrants Liu Bai interviewed, who now makes a precarious living collecting rubbish. Credit: Liu Bai. The blows of these migrants’ post-dam fates are gruelling: loss of traditional livelihoods, no income, the disappearance of the modest resettlement funding amounts promised (or, at least, sums significantly reduced by corruption at the local government level), hostile new neighbours and sub-standard conditions in the resettlement sites they were moved to, as well as the loss of hukou (permanent registration status) as a consequence of moving — which guarantees basic housing, a living allowance, medical insurance, and access to education. Without hukou in China you are literally reduced to nothing. What does come through in these stories of punishing hardship, cruelty, government mismanagement and wrongdoing is the formidable spirit of human resilience and our innate desire to be heard. This same journey recorded and narrated by Liu Bai in 2012 also includes three more recent letters by Three Gorges Dam migrants (all dated April 2013 and in the voice of their original authors) who seek through Liu Bai — just as Wang Like did — the ears of a larger, listening world to stop and hear their stories of endurance, the only restitution they may ever know. Read Liu Bai’s “‘Returning’ Three Gorges migrants face a number of challenges”. Letter One: Why do you local officials treat us migrants unlawfully?